A fireplace is much more than a way to heat a room; it’s a central feature and focal point for your hotel or resort. Your guests will love gathering around the fire to watch the flames and feel their warmth. Stromberg fireplaces in glass fiber reinforced concrete (GFRC) can be used in lobbies, outdoor kitchens and even in private suites. No matter where you put your GFRC fireplace from Stromberg, you can be sure it will become a favorite gathering place for your guests. Stromberg provides the largest selection of fireplaces anywhere, and they come in a range of non-combustible, safe materials. A Stromberg fireplace for your hospitality business will be of the highest quality and custom design. Choose GFRC fireplaces, mantels or surrounds from Stromberg not only for their attractive appearances, but also for the added benefit of safety and security. Made from non-combustible materials, it’s fire resistant and very durable. A GFRC mantel or surround won’t crack or swell when exposed to high levels of heat for prolonged periods of time. These qualities make a GFRC fireplace a winning choice for your hospitality location. Glass fiber reinforced concrete is also an excellent material for use in an outdoor fireplace since it’s moisture resistant and can stand up to all kinds of weather. 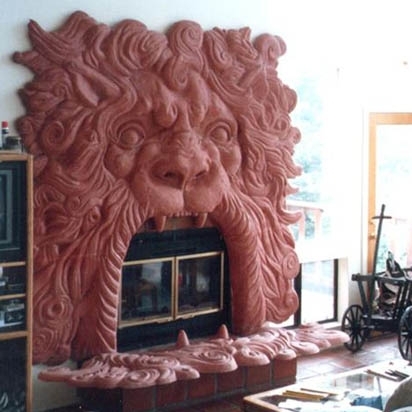 If you like the look of natural stone, Stromberg can design your fireplace surround to look like terra cotta or limestone. Your mantle or fireplace surround can also be made so that it can be painted in a color that matches the décor in your hotel, restaurant or casino. Stromberg uses molds in the manufacture of your fireplace; this means that you’ll be able to have the design you envisioned, no matter how complex it may be. Glass fiber reinforced concrete makes use of glass fibers for reinforcement instead of steel. This makes it much lighter in weight, less likely to rust and easier to work with. You’re much more likely to achieve the end result you envisioned with a GFRC fireplace. GFRC is light yet strong, resistant to all kinds of weather conditions, and has fire retardant qualities. It’s one of the most attractive materials you can use for your hospitality fireplace, and Stromberg has 30 years of experience in its use. GFRC has been laboratory tested and in real life situations has been found to last as long as pre-cast concrete. Your GFRC fireplace from Stromberg will be virtually indestructible. Stromberg will put their accomplished team of experts at Stromberg Architectural Products to work for you. They will craft a functional, state-of-the-art fireplace in the design of your choice. Stromberg is here to help you with CAD details, design assistance and all specifications. Contact them today at (903) 454-0904 for your free custom quote, or email them.